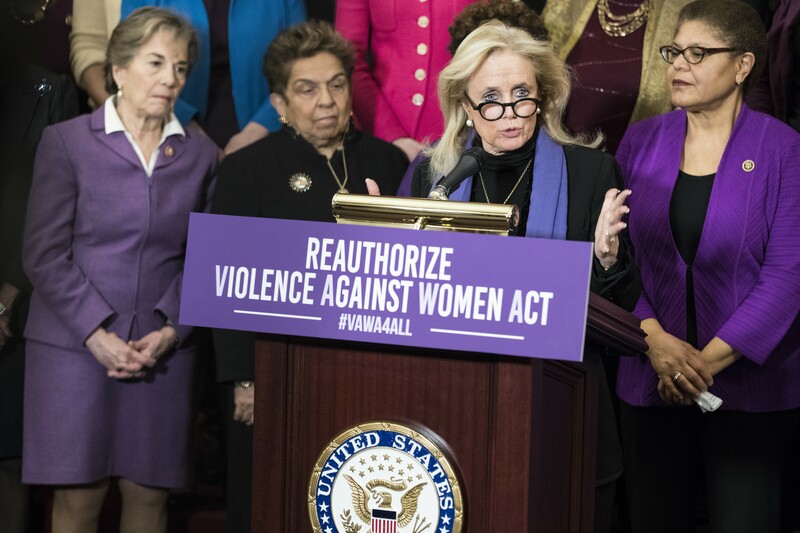 Rep. Debbie Dingell (D-Mich.) speaks at a news conference for the reauthorization of the Violence Against Women Act on Capitol Hill in Washington, March 7, 2019. The National Rifle Association is trying to defeat a provision in the new Violence Against Women Act that could deny firearms to abusive boyfriends. But Congress is changing. The House is set to vote on the legislation this week. The law expired in February. But the bill includes a new provision — aimed at curbing sexual violence by expanding law enforcement’s ability to strip domestic abusers of their guns — that the NRA does not like. The measure closes the so-called boyfriend loophole by barring those convicted of abusing, assaulting or stalking a dating partner or those subject to a court restraining order from buying or owning firearms. Times have changed for the gun lobby. A wave of freshman Democrats in Congress were elected on a promise to enact new gun restrictions and they proudly campaigned against the NRA. Roughly half of all female homicide victims are killed by what experts call “intimate partners” — meaning current or former spouses or dating partners — according to a 2017 study by the Centers for Disease Control and Prevention. And about half of intimate partner homicides involved dating relationships, according to David Keck, director of the National Resource Center on Domestic Violence and Firearms. The reauthorization bill has one Republican co-sponsor, Rep. Brian Fitzpatrick of Pennsylvania. The NRA has decided to “score” the vote on the Violence Against Women Act, meaning it will keep track and publish how lawmakers vote in an effort to either reward or defeat them in the next election. While the move is not likely to keep the bill from passing the House, it does make it more likely that the “boyfriend loophole” provision will be stripped from the act when the measure arrives in the Senate.